Let's Stamp! : Sweet Summer fun! Summer may be a long way off but that doesn't stop us having fun with this gorgeous, limited edition set from Stampin' Up! This has to be one of the most versatile sets on offer in Sale-a-bration. I demonstrated this technique at my open house on Friday. It's made using the brayer resist technique. Start off by randomly stamping the branch stamp from Sweet Summer in stazon on your glossy white cardstock. Use a careful touch as the smoothness of the cardstock can make the ink slide if you are too heavy-handed. Put it to one side for a moment or two to let it dry. In the meantime stamp some of the spiky flower images on to another piece of glossy cardstock, again using stazon. When both pieces are dry, use your white crayon (I borrowed mine from my son's pencil case!) to highlight certain parts of your stamped images. Now for the fun part - the brayering. Ink up your brayer with the Bashful Blue ink. Making sure that you spin it every now and then to make sure there are no lines on the brayer when you are inking it up. Then starting off the cardstock run the brayer over the top of your images. Repeat a couple of times until you have the depth of colour that you want. Then take a piece of kitchen towel to wipe off the excess ink over the white crayon marks and you should really see them pop. Repeat with the Rose Red ink pad and the flowers. Stamp your greeting at the bottom of the page. I used a greeting from Just Believe. 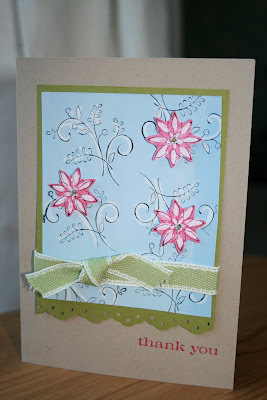 Then make the rest of the card up as you see in the photo, making sure you add those wonderful Stampin' Up! rhinestones to the centres of your flowers. Please get in touch if you'd like to order any of the items I used to make this card.